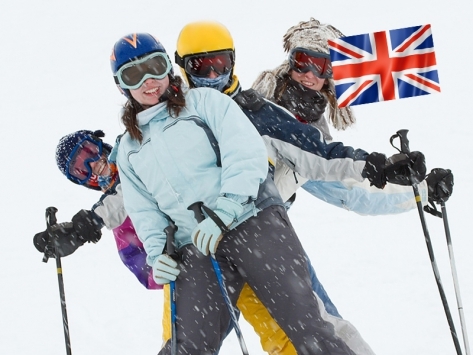 Experience intense winter combining the passion of skiing with language learning. At Jeunes Diplomates even learning during the holidays is a pleasure, both the method of language teaching and stimulating and fun. Come and share our camps and winter language courses. At JEUNES DIPLOMATES we consider the quality of the accommodations to be an essential condition for the wellbeing of our campers and therefore our programs are organized solely in top quality hotels. Very close to the center of Megève, just a few meters from the Rochebrune chairlift, the children will stay in apartments which sleep up to 6 people. Each apartment has heating and a fully equipped kitchen. The apartment also has a television and private bathroom with a bath. All evening meals are taken in the restaurant. To maintain an organization at a comfortable level, we deliberately limit capacity to 30 children. This allows us to create a multicultural dynamic and to look after the wellbeing of each of our participants. Children have their meals in a restaurant on the ski slopes at lunchtime and in the evening, in the restaurant of the hotel. The menus are prepared by the hotel’s chef who takes into account a balanced diet and the tastes of the children. We can organize special menus (vegetarian, gluten-free etc.). We just need to be advised in advance. During the summer, to practice their language skills, students produce a play helped by the teachers and counselors where everyone can give the best of himself while having fun. JEUNES DIPLOMATES winter camps offers you the opportunity to betrained in smalls groups by excellent professional instructors. The ski and snowboard lessons are given by the ski instructors from the ESF (Ecole de Ski Français) school of Megève. The children will be placed in groups adapted to their level and the ski instructors will help them perfect their technique and discover new sensations on the snow. At the end of the week the children can pass their ‘star’ ski or snowboard test. The aim of these activities is to have fun and to surpass yourself. Children may be beginners. They can take ski lessons from beginner to advanced free-skiing training, Special Teens Crossbag, or snowboard lessons. – GROUP LESSONS: SKIING WITH FRIENDS IS GREAT! 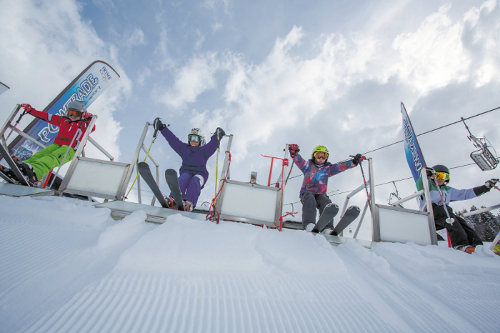 7 to 16 year olds: From the age of 7, your child can begin his adventure on the “big” slopes. In a friendly and vibrant atmosphere, the ESF instructors of Megève will combine technical lessons with fun so the children have a great time. Accompanied by ski instructors, your child will benefit from the technical advice in the friendly atmosphere of a dynamic group whether they are a beginner or a more advanced skier. – INITIATION COMPETITION for 7-12 year olds: Has your child obtained a gold star and wants to discover competition skiing? The Initiation Competition course has been specially designed for children from 7, having obtained the Gold Star. On the program: skiing in all types of snow, training for the giant slalom and special slalom and two passages of timed tests (flèche and chamois) included in the course. – SPECIAL TEEN TRAINING: Minimum 13 years old with the Bronze Flèche: Objective: all terrain performance! The program … Skiing in all types of snow to try new sensations, with some slalom and freestyle to control the different situations and especially to have fun! – FREESKI TRAINING: Minimum 14 years old with the Silver Flèche: Skis in the air and the head upside down! The Freeski training offers an explosive cocktail of sensations. The specialist instructors will teach techniques and reflexes to achieve your first figures and master skiing on all snow and all terrains. 2 Airbags in the Freestyle Park Waidzai in Rochebrune guarantee learning the wildest jumps safely! A great way to enjoy the snow by combining Off-Piste, Jumping, Ski-Cross and Freestyle. – CROSSBAG TRAINING: Minimum 8 years old or Etoile d’or or Surf 2: Take to the skies! In Alpine Skiing or Snowboarding! The field of Rochebrune with its Waidzai Park, its Boarder Cross and Freestyle airbags *: A true playground for the more adventurous! The program … Enjoy learning in the Waidzai Park, develop balance, coordination and performance having fun in every sense of skiing. * These giant air bags ensure a safe landing where you can unleash your passion! – SNOWBOARD LESSONS: from 7-17 years old: Great atmosphere guaranteed! Whether you’re a beginner or an advanced Freestyler, join the passionate team of instructors who will accompany you and your friends throughout the week, in the discovery, development and practice of snowboarding. You will learn a great sport full of sensations that will make you dream! Progress guaranteed! This is the perfect opportunity to practice your favorite sport in the mythical resort of Megève, with its multitude of snow parks, off-piste and secret spots. 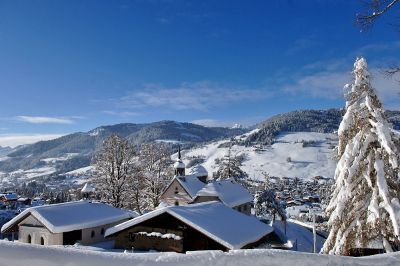 Our Language school is situated in the center of the village of Megève, in close proximity to the ski slopes. Welcome to ski paradise! What better way to combine improving your French or English with intensive training in your preferred sport? Our ski and snowboard programs allow you to do both. At the end of the day we get together for a special event: team games, fun activities etc. This programme is ideal for a language camp experience in safety.